The new building for the community center is located in the northwestern site area closest to the church, thus forming the new space edge to the church forecourt. The building is designed as an open space structure oriented towards the southern square. It defines the main access to the community center by an indented function box, the so-called “Wandelgang”, on the northern side of the road. 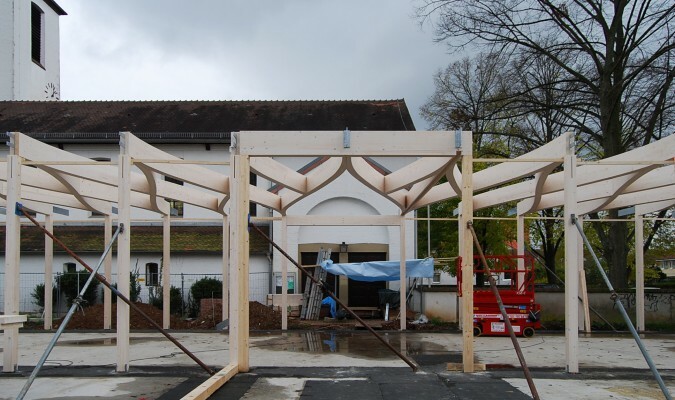 Analogous to the space-determining timber church ceiling, the new building is designed as a floating, spatially load-bearing structure opening up facing the churchyard and the community. 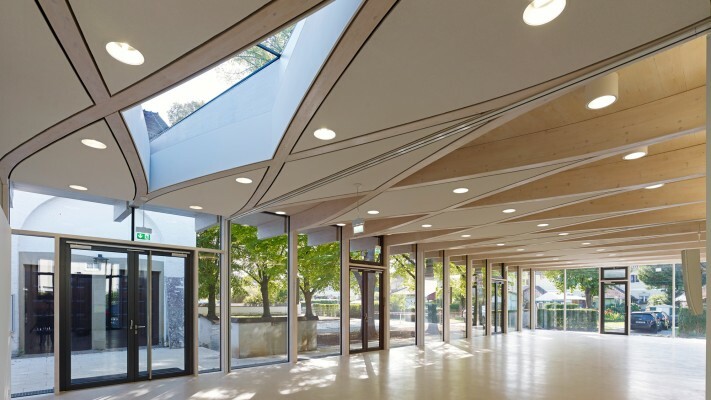 The main defining element is the ceiling structure made of glulam beams that superimpose dynamically the hall and group rooms. To the south, the continuous glulam double-span beams form a cantilever creating a roof overhang for a spacious outdoor area. The vertical load transfer from dead weight, extension, wind and snow is realized via articulately connected timber columns. The loads from the hinged columns are transferred through strip foundations into the ground serving also as frost protection. For the intersections of the curved support elements special connection details were designed, also as variant proposals.